Many of the kitchen projects we work on start in the same way — with heavy, dark cabinetry that closes off the room and makes it feel dated. 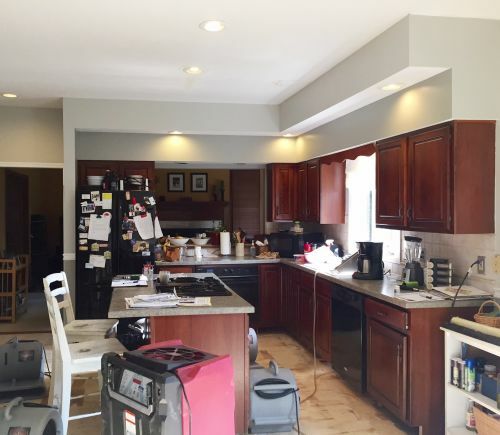 We had just such a challenge with a recent kitchen remodel, and we were able to successfully transform the room to a modern and spacious place to gather. As you can see, when we started the project, we were dealing with a kitchen that had lots of great storage space, but the dark wood of the cabinetry made the room feel narrow and cramped. Our goal was to keep all of the storage, while making the space feel more open. One of the first things on our agenda was to lighten up the space. 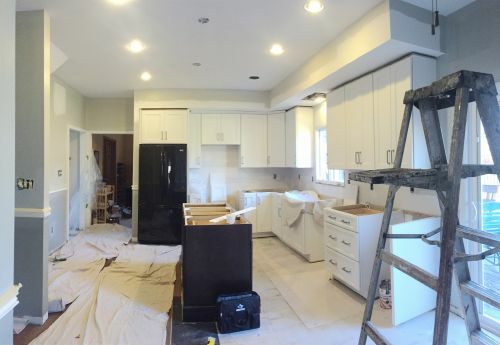 We opted for white cabinets, to make the room feel more spacious. Even mid-remodel, you can see a big difference! 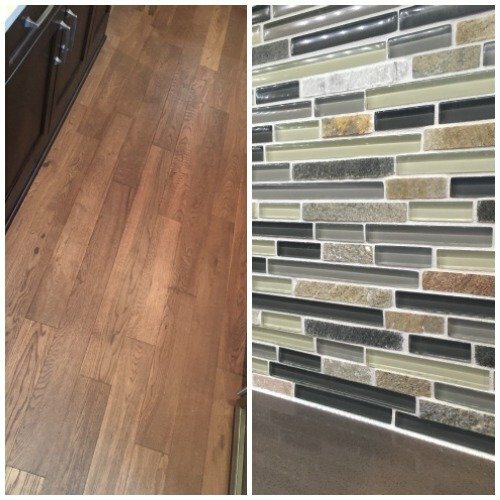 We also installed hardwood floors and a tiled backsplash. The hardwoods are oak, with a matte wire brushed finish. The light color of the oak helps brighten the space, but there’s still enough color to create contrast with the white cabinets. The backsplash is a mix of linear glass and stone. It’s a beautiful blend that really adds depth to the room. These details take the room from a basic kitchen to one that is full of style. A backsplash is an easy way to add style to your kitchen, and the options are endless! As you can see in the finished project, we actually ended up adding cabinet space by framing in the pass through window and installing additional storage. We also played with contrast in the cabinetry and island. The island features darker cabinets and a lighter quartz countertop. 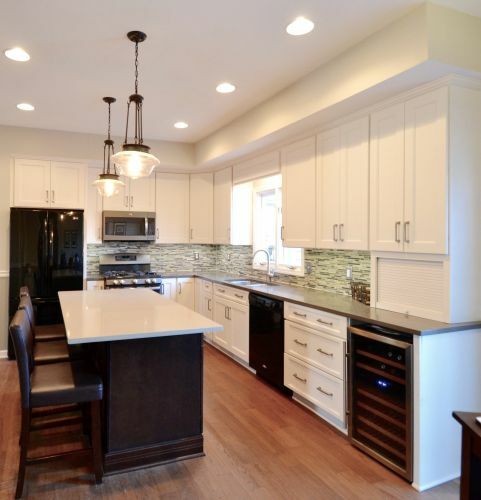 The perimeter cabinets are white, with a slightly darker countertop. This is another small detail that adds depth and dimension to the room. The hardwood floors, backsplash, updated appliances, new fixtures, and wine refrigerator all bring this kitchen into the 21st century. This once dated kitchen is now a bright and open place for eating, entertaining, and spending time together. Is there a room in your home that needs to be updated? Is there a space you’d love to open up and brighten? Our team would love to help you create the kitchen or bathroom that is right for you. Contact us today to start your project. Wondering how much you can expect to spend on a remodel? Our budget calculator is a great planning tool.